A star, spherical in shape, is a thermo-nuclear furnace composed of a soup of super-heated gas – the fourth state of matter, called plasma. A star is held together in a precarious balancing act with gravity pressing down in every direction towards its centre and the opposing outward pressure resulting from the energetic particles darting about in its core and upper layers; a state called hydrostatic equilibrium. Stars spend the majority of their life cycle in this state, on the main sequence. At its heart, where enormous pressures (250 billion bar or 10^16 Pa) and temperatures (15.5 million degrees Celsius) are present, nuclear fusion results in the transmutation of hydrogen to helium. This process can only occur when the impact between two proton collisions are head on. When two protons get close, they repel each other as a result of photon exchange. To fuse together, they need to get so close that they are effectively overlapping; they need to overcome the Coulomb barrier. However, the Sun is just not hot enough for protons to overcome the Coulomb barrier. The W particle steps in to save the day. When two protons get close enough, one of the up quarks changes to a down quark, with the emission of a neutrino and a positron, meaning that one of the protons changes to a neutron, and now freed from photon exchange, the two particles can fuse by means of the strong force, to make a deuteron (heavy water nuclei). This quickly leads to helium on collision with another proton with emission of life giving energy to the star. The Maxwell-Boltzmann distribution of particular speeds states that just one proton in every 100,000,000 (100 million) is travelling fast enough to overcome the electrostatic potential (Coulomb barrier) between the two positively charged particles, whilst just one collision in every 10,000,000,000,000,000,000,000 (10 billion trillion) results in fusion! It has been estimated that a single proton in the core of a star makes a head-on collision with another proton once every 14 billion years, which means that, in terms of protons, nuclear fusion is an extremely rare event! However, due to the truly astronomical number of protons composing the stellar core, 616,000,000,000 (616 billion) kilograms of protons are converted into 611 billion kilograms of helium each second, with the remaining mass being converted to cosmic rays such as neutrinos and energy such as electromagnetic radiation and acoustic energy. Although these quantities sound enormous, to date, 4.6 billion years since its birth, only 4% or the original supply of hydrogen has been transformed to helium! The emission profile of the sun (solar spectrum) is broad, rising steeply from the energetic x-ray and ultraviolet (UV) region, peaking at 555 nm in the visible portion (green light) and falling sharply into the red whilst tailing off with a shallow incline into the radio frequencies of the electromagnetic spectrum. The emission profile of the sun closely resembles that of an ideal blackbody, the curves of which are shown for various temperatures in the image below. 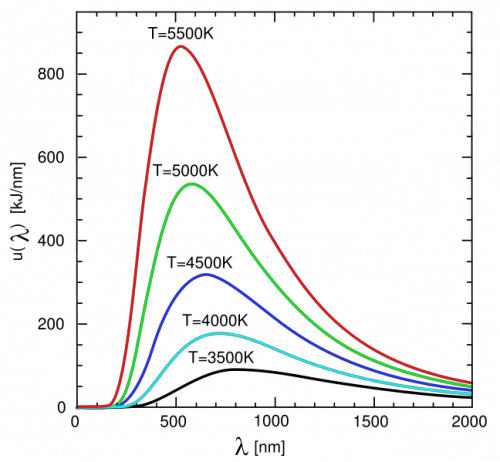 The curves are a graphical representation of the energy at each wavelength of emission (Planck’s law). This means that if the total energy for each wavelength across the entire emission spectrum is summed up, then this will give the total amount of energy emitted per unit time per unit surface area, which is known as the Stefan-Boltzmann law.